Three months ago today, my father died. It was the first time that I had lost anyone I knew well and cared for deeply. I went through a series of intense and unexpected experiences that reminded me of this book. So it was at the back of my mind, and I happened to recommend it to my friend Anitha who is a doctor in Ireland. I had read this bestselling book years ago and was curious about what Anitha, who is one of the smartest and most sensitive thinking people I know, would have to say. I was also a bit worried that I may have overrated it, so I read it again to see what I felt now, two or three hundred books later. 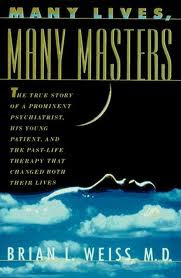 Many Lives, Many Masters is a case study written by a psychiatrist in the USA. He is having difficulty treating his patient, a lovely young woman named Catherine, and after eighteen months with no progress, he decides to try hypnotherapy, which he believes will work to help her remember long-forgotten incidents and bring her closer to resolution. During the course of several sessions of hypnosis, Catherine regresses into a series of past lives and this book is about her lives and about what happens between them. I did enjoy the book this time round, and found it easy to read and inspiring. However, there were a few things that put me off slightly. For one, I believe that the concept of “Masters” should really transcend gender. But this book seemed to me rather male centric. I also didn’t care for the concept that there were beings who were “in charge” and who controlled things, and there was also a slight hint that they had it in them to distribute punishment if they felt inclined. I prefer to think of the world as controlled by natural laws – and the phenomenon of natural cause and effect. Perhaps these are just different ways of looking at the same thing and perhaps truly evolved people could look at it like that. I however suspected that the inflexion I objected to had been introduced – maybe not consciously – to make people from religions that preach retribution and male superiority feel more at home. After all, reincarnation is a distasteful concept to some, and it is the central theme of this book. I found it an easy read and quite fascinating. As a Hindu, I was taught to believe in reincarnation and that our present life sufferings are punishments for wrongs committed in past lives. However, I never truly believed in such things. So when I started reading this book, I found the story implausible. But as I kept reading, I began to believe what it said. As it is the case history of a patient written by a prominent psychiatrist, both of them non-Hindus and all hypnotic regression therapy sessions recorded by him, it appears legitimate. Also, I realized that I have no right to be sceptical about things I don't know about. As much as there is no scientific proof regarding reincarnation, there is no proof against it also. Perhaps, we have to realize that if things are unknown to us, it doesn't mean they don't exist. Since we cannot see what happens after death, we can only listen to such astonishing stories and believe in the good lessons they teach us. I'm still thinking about the book as I just finished reading it. I find the messages comforting and at the same time a little frightening in some ways. The philosophy about life, death, reincarnation, the different levels and so on are all quite comforting. Also, it is a consolation that we may meet our loved ones in future lives and that there is no need to fear death. On the contrary, I found it a little frightening that there will be future lives to pay debts, about masters and spirits around us, although they seemed to be kind souls who are only trying to help us. The case history is convincing enough especially as her description of past lives seem detailed and consistent, which gives it more credibility. Having said that, there are a few instances which I found a little far-fetched. For example, his description about Catherine going to the races with her father and winning all that money and donating it to the first street person she met; Catherine recalling the exact year in B.C. ; the doctor's claim that his patient had no access to his family history regarding his father and son is not convincing as she works in the same hospital. I wondered at times whether in his eagerness to prove his point, the author had lapsed into making these flimsy claims. Well I may be wrong about these, as I cannot be certain whether they are impossible or untrue. So maybe I should not dwell on such doubts. On the whole it was stimulating to read this book and the explanation given by the masters about our purpose in life and I do think it will help people who read it take a positive and brighter outlook on life in general and on our fellow human beings in particular. I think Hindus and Buddhists will find it easier to relate to compared to people from some other religions. I am not aware if any other religion proposes reincarnation theory. But there will always be sceptics as there are people who always question anything and everything that can't be proven and it is a pity that the authenticity of Catherine's past lives cannot be verified from historical data. Whatever the case, I think on the whole, the underlying message of the book makes sense on a spiritual level and if we ponder over the messages from the Masters and take lessons from them, our lives may become simpler and happier. I certainly do not impugn Dr. Weiss humanity, compassion, or his attempts to help his fellow humans. But by creating a quasi-religion based on clearly fallacious ‘recovered memories’, he destroys his own message by not providing any peer-review or replicable study of his outrageous claims. 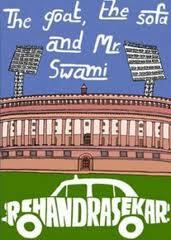 This book is set in a Bombay I remember with fondness and nostalgia. Anjali writes about places that I left behind nearly twenty years ago but will always have a place in my heart – and she describes them with a skill that I enjoyed very much. I could quite well identify with Mohan, the middle-aged hero, a reflective person with a deep commitment to his family but equally the capacity to view them objectively. I read this book a few months ago and I think I enjoyed it particularly because I read it aloud to my friend Gladys who knew Anjali Joseph as a child. We both admired the literary talent it represents, and didn’t feel the need for more action than it has. I mention this because I read a number of critical reviews at the time which complained that the reviewer had read on, waiting, but nothing exciting had happened and therefore concluded that this was not a good book. And I thought to myself – I wonder what these people would have had to say about Jane Austen if they were reading her for the first time, before all the hype. But I was also reminded of Mohsin Hamid and his sparse, laidback style which uses few well-chosen words to bring a whole region and culture alive. 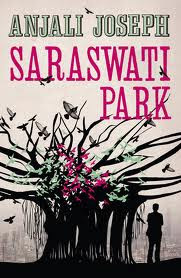 It struck me that one of the central characters of Sarawati Park could even, in all facetiousness, be described as The Reluctant Homosexual. I will also say that I wouldn’t like to call this “a coming of age novel” even though it does focus on a brief period in this young man’s life when he suffers, as young people do, while struggling to find themselves. Finally, as Gladys pointed out, this is one of those rare books about an India which is not dramatically dirty and corrupt, desperately poor and wretched, or exotic, or disgusting in other ways and therefore may not be of great interest to gaping audiences in other countries and perhaps will not win the acclaim of The White Tiger or God of Small Things (though perhaps it should). It’s just about normal, decent, reasonably comfortable people like you and me; and that is why she, for one, liked it a lot and would recommend it to everyone she can who doesn’t know India, as representative of the life many of us are familiar with. This is a book in the tradition of Murder on the Orient Express: a corpse, a small group of improbable suspects, and a caricatured but lovable detective. 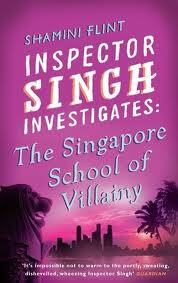 Inspector Singh is now in his third book and just as roly-poly, cynical, scornful of authority and X-ray eyed about human nature as before. And yes: he’s still soft hearted and crusty-exteriored too. I love relaxing with books like these – especially when as well written as this one. It’s not just the tight, precise, almost formal and aesthetically appealing language it uses that I admire but also the liberal sprinkling of offbeat expressions and creative metaphors that it frequently surprises readers with. As crime fiction per se I must admit I wasn’t very impressed with the plot because almost all the whammies were visible way before they were executed. What I did like was the use of Singapore as setting and the glimpses of this unlikely tourist, education and career destination as police state, multicultural and multiracial paradise, haven for expatriates (where life is a carefully arranged dream) – and even little treats such as a visit to the legendary Raffles Hotel, that famed Meeting Place of the World’s Travellers. 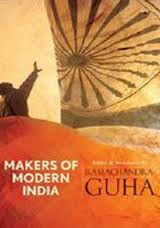 At one level the book even serves as an incisive exposé of oppressive Indian society and the hidebound traditions and deep rooted prejudice which have the power to cripple and destroy its very brightest and most precious people, even as India claims its place as a user and supplier of high technology and a greedy market for the developed world. When she had married Singh, he had been a junior policeman with a bright future. He had been smart, fit and ambitious. She had imagined him as the commissioner of police, attending functions at the Istana, the palace residence of the President – wife by his side, of course. Instead, Singh had been assigned to his first murder case and never looked back. He had abandoned his bright future to devote his life to the business of hunting down killers. It was all so sordid. People didn’t get killed without good reason. She, Mrs. Singh, didn’t condone murder, of course. But there was no doubt in her mind that the victims were at least partly to blame.